“I was looking for the institution that offered the highest level of learning, and that’s what I found here. I also think studying civil engineering opens up a lot of opportunities, because you can use it in different ways, from bridges to highways to buildings,” says Dickerson, who has made annual contributions to Carnegie Mellon each year for over three decades. For Dickerson, the decision to give back to the school where he got his start was a straightforward one. “If you can help, you should,” he states. It’s a philosophy and a tradition that he hopes others will continue, so that generation after generation of alumni also give back to support others in achieving educational and professional success. 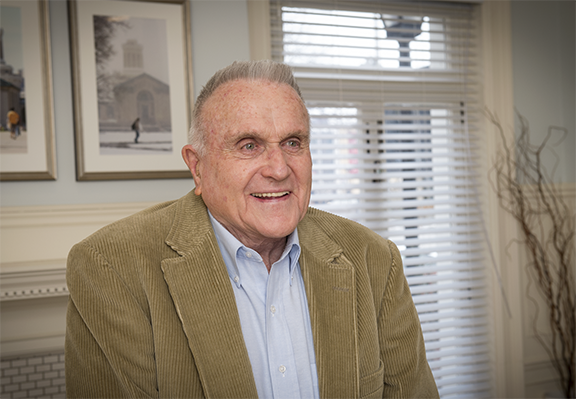 Dickerson’s own accomplishments started soon after he graduated with his bachelor’s degree in 1948 and started building bridges within his father’s business. During his 47 years in bridge construction, his company built more bridges than any other contractor in Pennsylvania, including many of those along Interstate 376 coming into Pittsburgh. Being at the job site was one of Dickerson’s favorite parts of his work. Before bidding on a project, Dickerson spent time down by the river envisioning the bridge that would one day connect the two banks, and what it would need to withstand the seasons. Later, as the bridge went up, he would often be found a hundred feet up in the air on the steel girders surveying the land and the work in progress. “I enjoyed being outside and doing something that not everyone got to do,” he recalls. Outside of bridges, Dickerson also founded two pioneering concrete companies and was among the first in the United States to develop and use prestressed and precast concrete, helping his company to save both both time and money. The concrete they manufactured was put to use in industrial buildings, high rises, airport terminals, bridges spanning major rivers and valleys along roads like I-79, and even the facade of Pittsburgh’s Three Rivers Stadium. During this time, he also became president of the Associated Pennsylvania Constructors and the Constructors Association of Western Pennsylvania. In the 1970s, while still working in manufacturing and construction, Dickerson bought a farm and began breeding Standardbred horses and Charolais cattle, with help from his wife Ann. With a herd of over 1,000 cattle, the couple ran one of the premier Charolais cattle farms east of the Mississippi for nearly 20 years. Never low on new ideas, by the 1990s, the couple had phased out their prize-winning cattle, reduced their focus on breeding racehorses, and started raising ostriches instead. By 1995, Dickerson had retired fully from construction and manufacturing. In the following year, he established Protos Foods, a company that offers high-protein snacks made from ostrich, beef, turkey, elk, and chicken—and whose products quickly became the number one sports nutrition meat snack in the U.S. Despite his many ventures and a busy schedule, Dickerson has always maintained a close relationship with Carnegie Mellon, including previously serving as Carnegie Mellon Alumni Association president, becoming an emeritus life trustee member of the Carnegie Mellon Board of Trustees, and earning the Carnegie Mellon Alumni Service Award in 1987. Though less visible than his bridges, buildings, and companies, Dickerson’s time and monetary donations to the university over the years are not to be overlooked when weighing his most important or influential societal contributions.